Indie Retro News: Starfysh - Wicked blaster released for the C64 by TND! 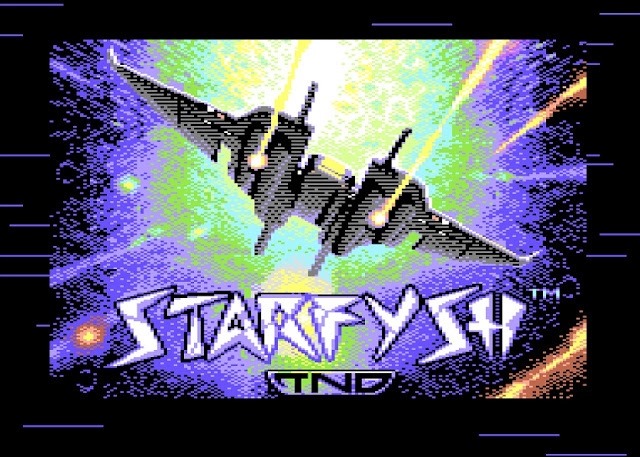 Starfysh - Wicked blaster released for the C64 by TND! Sam's Journey isn't the only game worth talking about this month, as The New Dimension has released a rather lovely C64 Shoot 'em up called ' Starfysh ', which was programmed and music by Richard Bayliss and graphics by Shaun Pearson. Now if you love the classic game Delta, then this game is the game for you, as not only does it look like a clone of that game, but it has varied enemies, different enemy wave patterns, multiple levels and the need to blast everything in your path for a decent score! Scrolling Shoot em ups come and go from TND, but this one is high up there in quality and gameplay. The overall level designs are pretty decent as you try to avoid crashing into what look like space stations, and the different enemy types added to the levels keep the game fresh throughout. As for the music this is what makes the game so much better, as when it comes to Richard Bayliss you know you'll be turning up the speakers just to impress the neighbours!